The Amazing Spider-Man #654 (2011, Marvel) NM 1st App Flash Thompson as Venom! AMAZING SPIDER-MAN #654 2nd PRINT 1st FLASH THOMPSON AGENT VENOM! Venom #40 2011 Series! First Printing! Mania Is On The Loose! 1st Mania Cover! 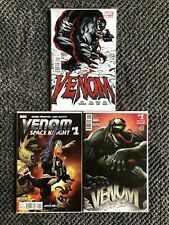 New ListingCarnage U.S.A. #1-5 (2011-2012) 1st The Mercury Team, Starring Spidey & Venom. CARNAGE USA #3 (2011) AGENT VENOM 1st Print HIGH GRADE Raw Unpressed MARVEL Hot! VENOM #1 2011 CGC 9.8 PAULO SIQUEIRA 1:15 VARIANT! RARE! Venom Vol. 1 by Remender NEW!!! (2011, Hardcover) Blank Cover. Only one in U.S. This page was last updated: 24-Apr 05:50. Number of bids and bid amounts may be slightly out of date. See each listing for international shipping options and costs.